Calamus root extract has disinfecting effect. Lightly tones and tightens skin, cleans the pores and eliminates acne. Calamus root is mainly used in hair care – extract increases shine and fluffiness and reduces hair loss by strengthening bulbs. In addition, a very good effect on the skin with dandruff – cleanses the skin, reducing its quantity. 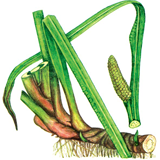 Calamus also applies to the seborrhea. A decoction added to the bath will soften the skin itching, dermatitis, additionally essential oil soothes and relaxes.